Healthcare is complicated, full stop. Bursting with complicated language, random abbreviations, medical jargon and complex statistics, it is no wonder many people find health information so difficult to understand. This struggle becomes even more difficult when you are suffering from an illness or being treated for a chronic condition. This is where health literacy plays a vital role. 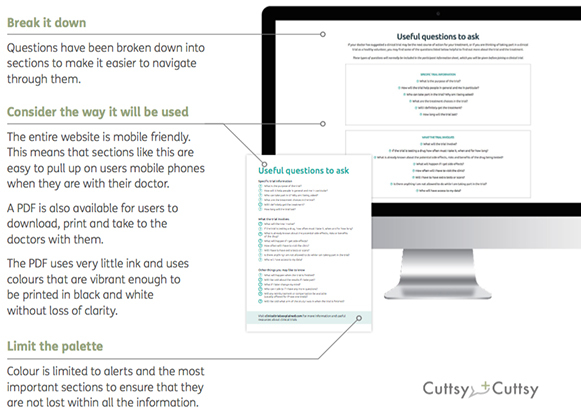 It ensures that patients understand the information they have been given but most importantly that they can act upon it. Defined as the communication of health information in ways that others can understand and act on, ‘health literacy’ is a crucial step in helping your patients make informed choices about their own health. 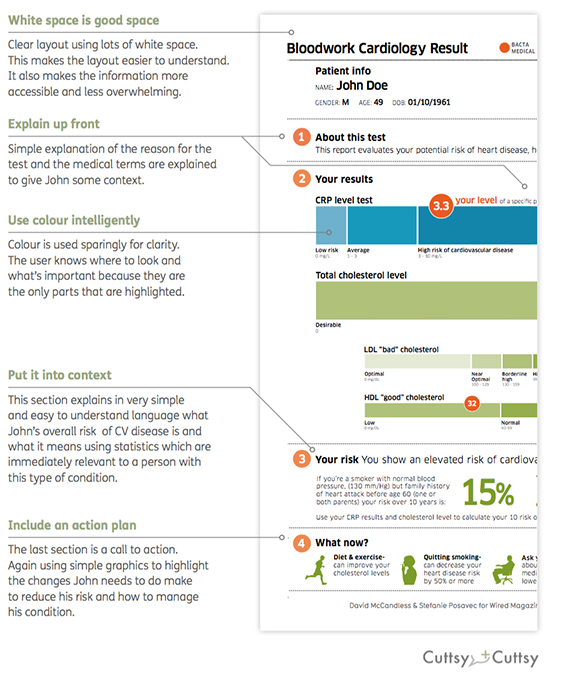 However, health literacy is not just about plain English, it is also about putting the right words into context and simple visualisation to ensure your target audience get the most out of the communication materials you produce. In this article, we want to share with you some great examples that show when done well, how context and simple clear visualisation can really make a difference. 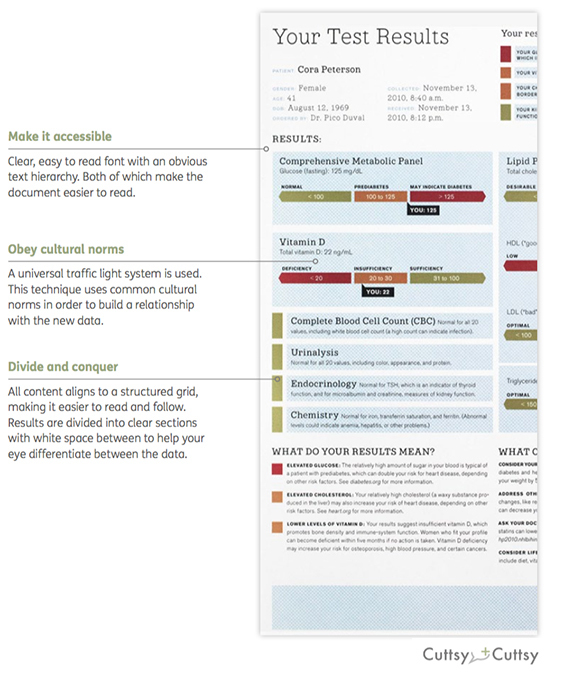 David McCandless, the author of Information is Beautiful and Knowledge is Beautiful, and Stefanie Posavec demonstrate how simple graphics can be used to explain complex medical information. 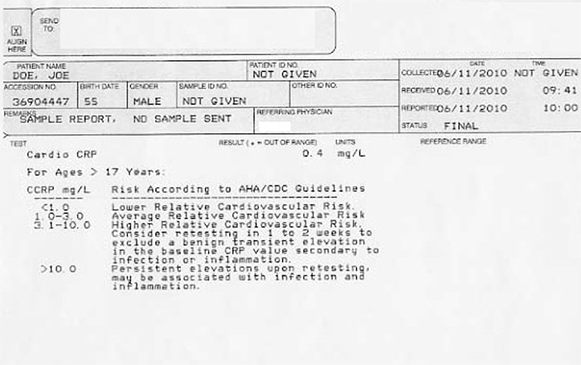 Many of us have been on the receiving end of blood test results, only to be given a sheet of meaningless numbers and figures and told not to worry as everything is fine. But how do you really know everything is fine and there is nothing to worry about? 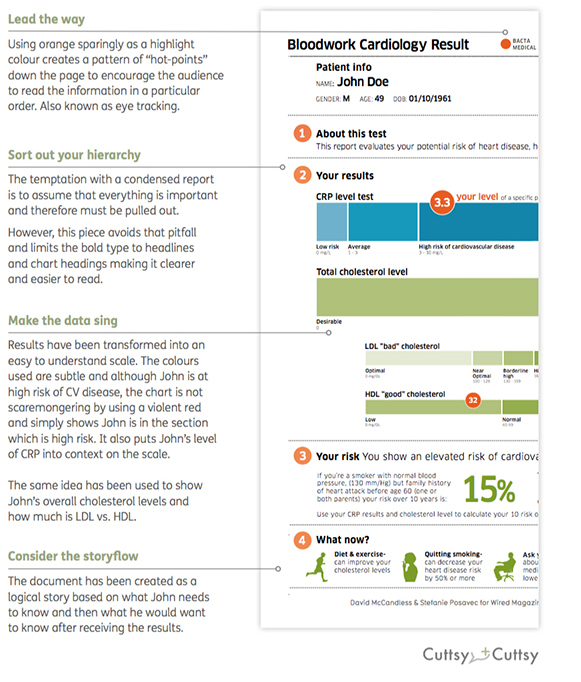 They took a complex blood test result and transformed it into something that is easy to read, understand and act on; all principles of health literacy. 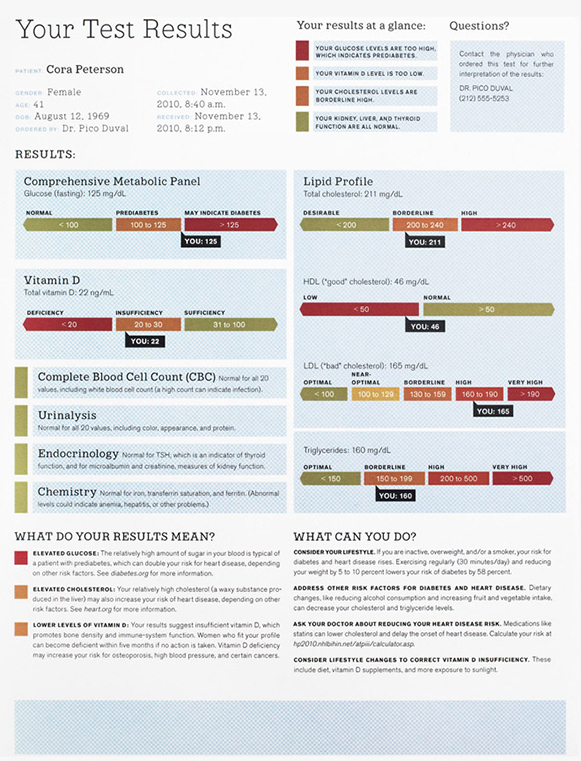 The second example we have chosen by Mucca Design takes another complex set of blood test results and transforms them into an understandable document. Along with clear and concise language, we like the way this example highlights the benefits of simple graphics to explain complex data. This is an example which we are really proud of. 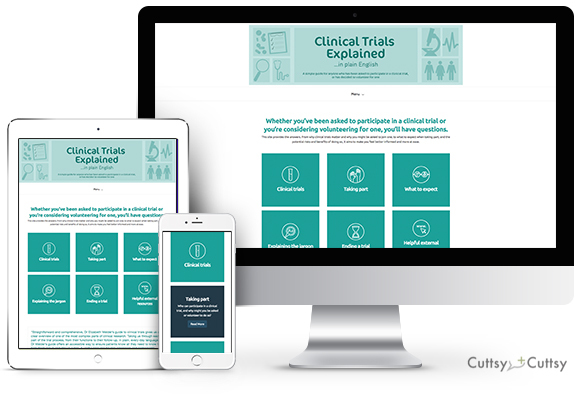 Following the success and endorsement by the Clinical and Contract Research Association (CCRA) of our e-book, we developed a supporting website. 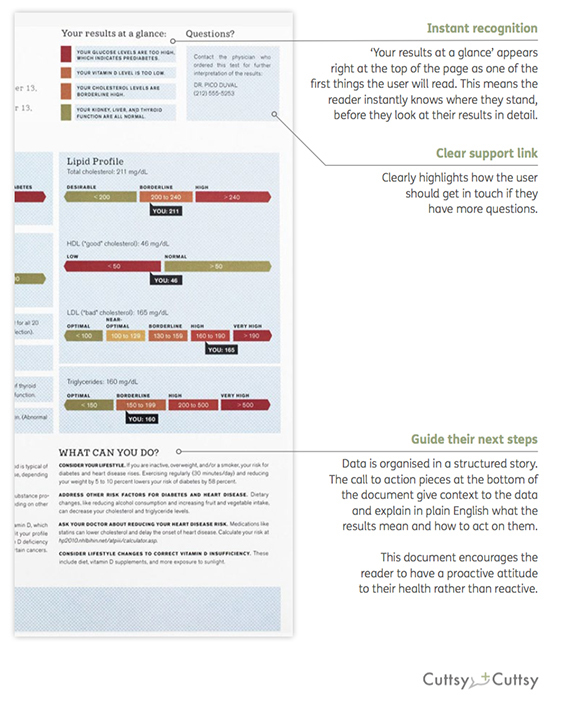 The website showcases how health literacy principles can be used successfully across different media to ensure information is understandable for all. 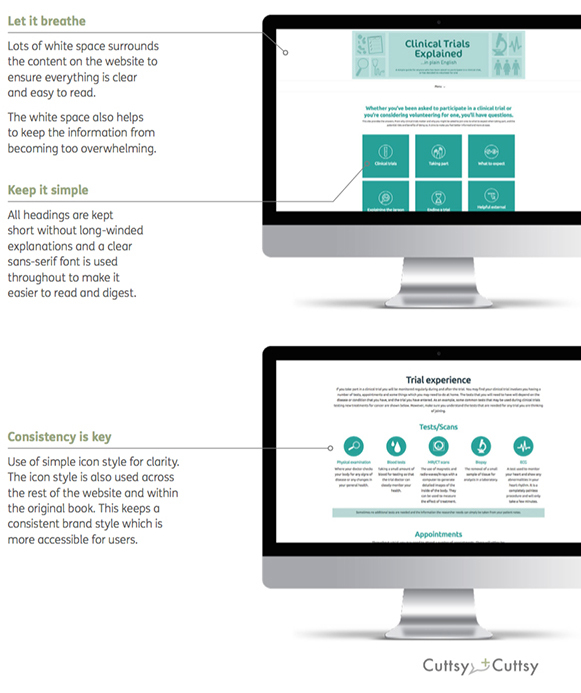 By keeping the website design clean and using splashes of colour for the icons and graphics alongside the use of simple language, we ensured that key points are not lost in a sea of information. As a healthcare communications agency we have a responsibility to take away the fear of the unknown and ensure patients understand the health information they have been given and when to act. 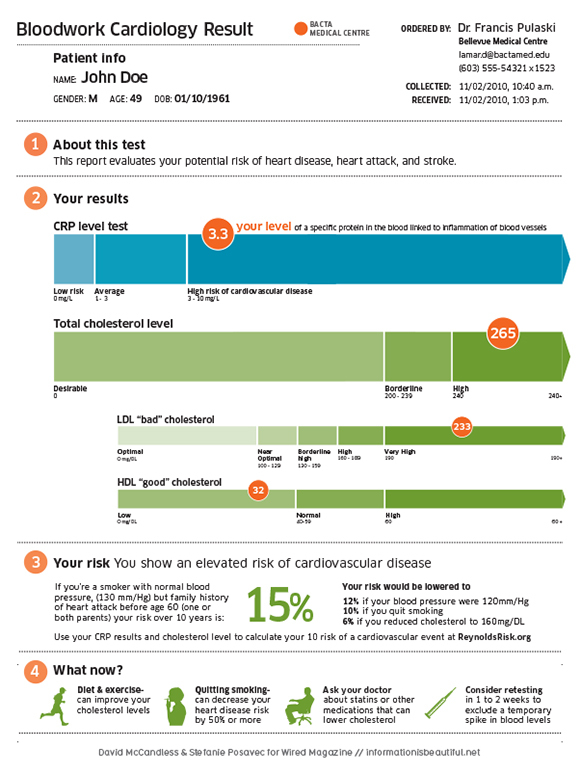 However, as we have highlighted in this article, understanding health information is not just about using plain English. 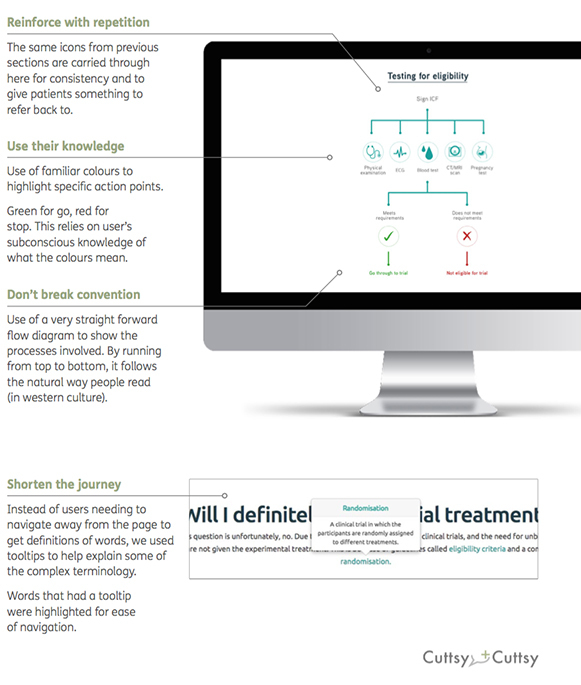 Visualisation and putting the right words into context are key to maximising accessibility. By using these principles, we can all help people feel more in control of the choices they make about their own health and actually make a difference to their lives. At the end of the day isn’t that what we all want as patients?